Price: $250 Tickets Now on Sale! Develop your intuitive skills, find answers to all your questions, and access the magic within you! Reality speaks to us in many ways. Cards and other tools of Divination contain symbols that create a resonance which allows us to read the messages inherent within them. The cards serve as a bridge to translate thoughts into concepts to be used for growth and knowledge. The techniques taught in this workshop will enable you to develop your intuitive skills, enhance your sensitivity, reach higher levels of consciousness, find answers to all your questions, and act with calm decisiveness in any situation. Theory and practice will weave together to make this course a fun but deeply insightful experience of the magic that’s possible to access in daily life, by anyone. Shama lived in the USA from 1968 to 2001. Those 33 years were dedicated to art, spirituality and teaching conscious awareness. Her life was exciting and full, from the 6 years she spent working with Francis Ford Coppola to the ones that she lived, worked, and traveled with Shakti Gawain, to the powerful years she spent in the Hawaiian Islands. 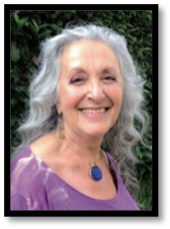 In 2001, answering a strong soul’s calling, Shama returned to her native Italy to become a Citizen of Damanhur, where she has spent the past sixteen years participating in Damanhur’s esoteric traditions and practical approach to sacredness, rituals and conscious living.